While the Italian motorcycle market after WW2 was dominated by practical, small-capacity machines, they were built by Italians, for whom competition is a cultural imperative. While the tales of success by small manufacturers in Grand Prix and the Giro d’Italia are the stuff of legend, the fierce competition in the scooter market is less well known. The two major scooter manufacturers, Piaggio (Vespa) and Innocenti (Lambretta), were fierce rivals fighting over a global market, and racing was one way to prove superiority. 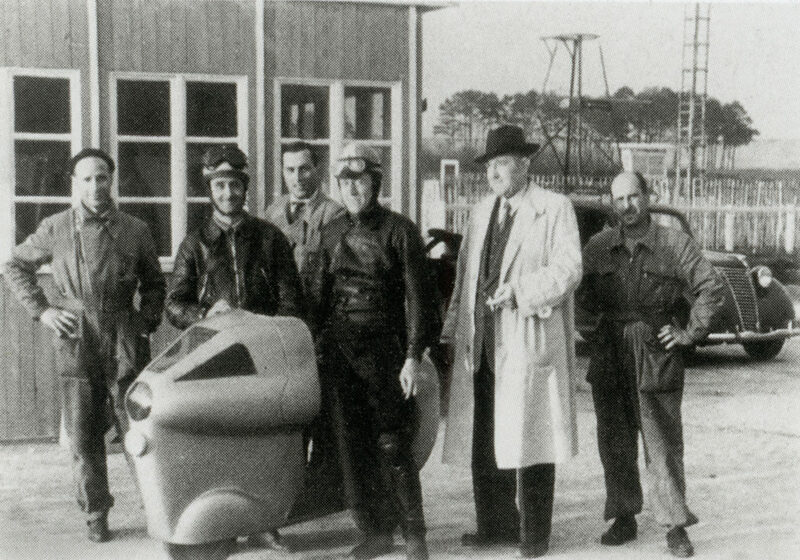 So was record breaking, and both factories indulged in a bit of long-distance and top speed record attempts, besting each other with ever more special and streamlined racers bearing only the barest resemblance to their scooters. Piaggio is a very old company, founded in 1884 to produce railway carriages, and by the 1920s was building aircraft as well. By the late 1930s their planes are world record holders for speed, and they naturally supplied the Italian Air Force with planes during WW2. Their factory in Pontedara was bombed flat, but the urgent need for personal transport convinced Enrico Piaggio to develop a two-wheeler for the masses, to commence production immediately. 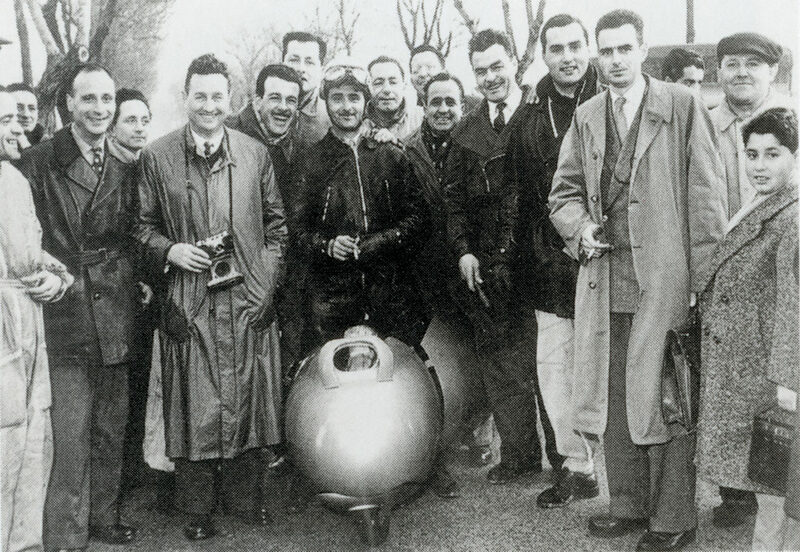 Their first prototype was nicknamed ‘Donald Duck’ for its awkward shape, so Piaggio turned to aeronautical engineer Corradino D’Ascanio for help. D’Ascanio hated motorcycles, finding their engines ‘a tangle of exposed parts’, but he’d already made sketches for a pressed-steel chassis scooter, which he fine-tuned in just a few days for Piaggio. D’Ascanio’s scooter would be easy to drive for both men and women, could carry a passenger, and didn’t get its rider’s clothes dirty. The first prototype was made within weeks of the final sketches, and manufacture began in April 1946. Piaggio dove in feet-first on production, with a commitment to build 2500 machines before they’d taken a single order. D’Ascanio’s design relied heavily on aircraft practice, which was no surprise; he had already built the world’s first functional human-operated helicopter, the DAT 3, in 1930. 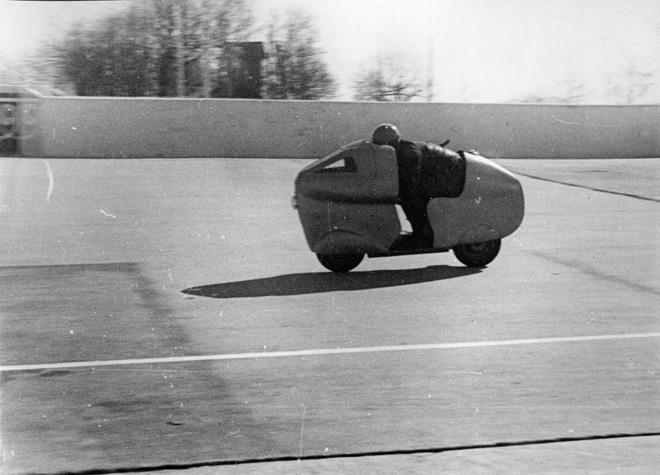 The MP6 prototype scooter of 1946, with its smooth, pressed-steel chassis, aerodynamic and enclosed shape, plus the front wheel support recognizable to any pilot in the day, was clearly related to D’Ascanio’s flying macines. Enrico Piaggio’s gamble paid off, as they’d sold 150,000 within 4 years, and over 15 Million to date. 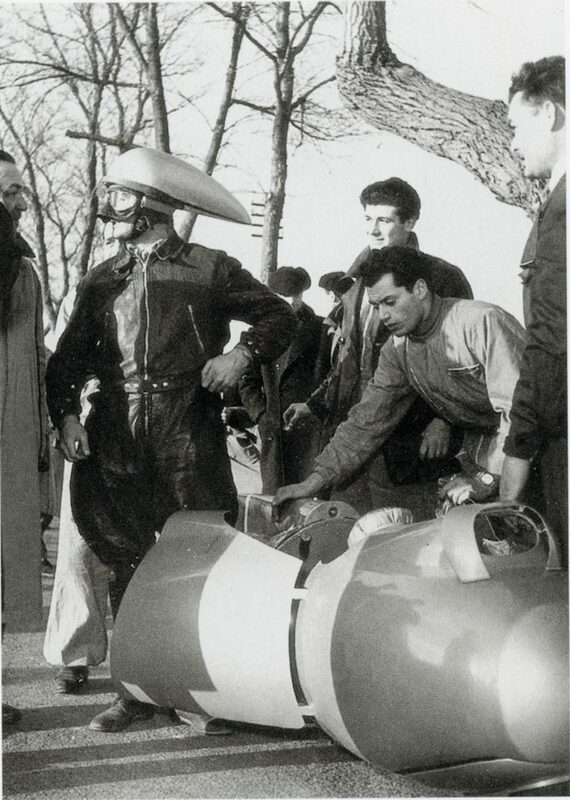 In 1951, a totally new racer was rolled out onto the Rome-Ostia Autostrada, between kilometers 10 and 11, to take the 125cc land speed record. 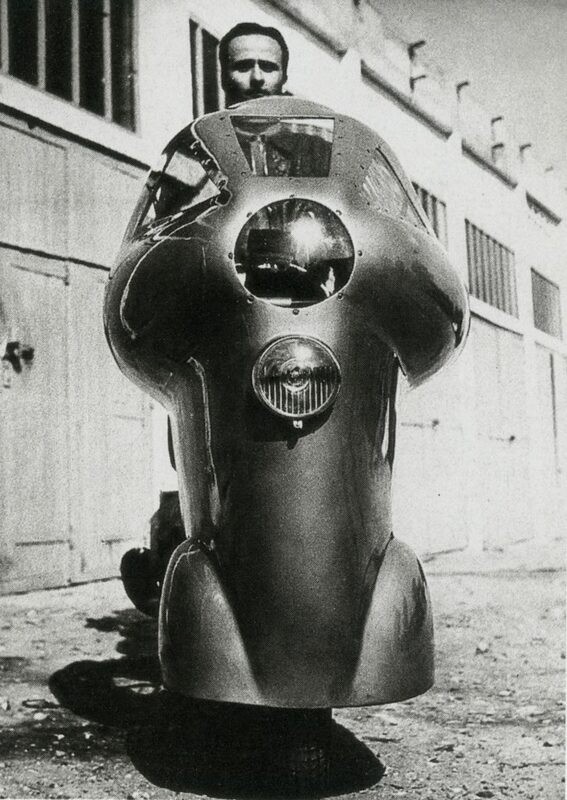 This new machine was long, low, and shaped like a rocket, which completely enclosed the rider, barring his streamlined helmet! 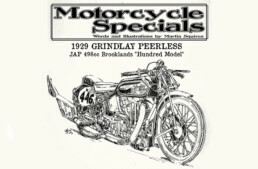 The engine was far from standard, too, with a twin-crankshaft, opposed-piston two stroke, with a common cylinder. The pistons moved towards each other, and at the top of their stroke formed a combustion chamber with their piston tops; it produced 19.5hp @9500rpm. While an unusual engine design for a motorcycle, it was common enough as a nautical engine using two-stroke diesel power. The engine used two carburetors and two spark plugs, and was water-cooled, and was held by an single rail aluminum frame, but the motor was placed beside the streamliner’s rear wheel to give some family resemblance to the Vespa roadster. It recorded a two-way average of 103.26mph. 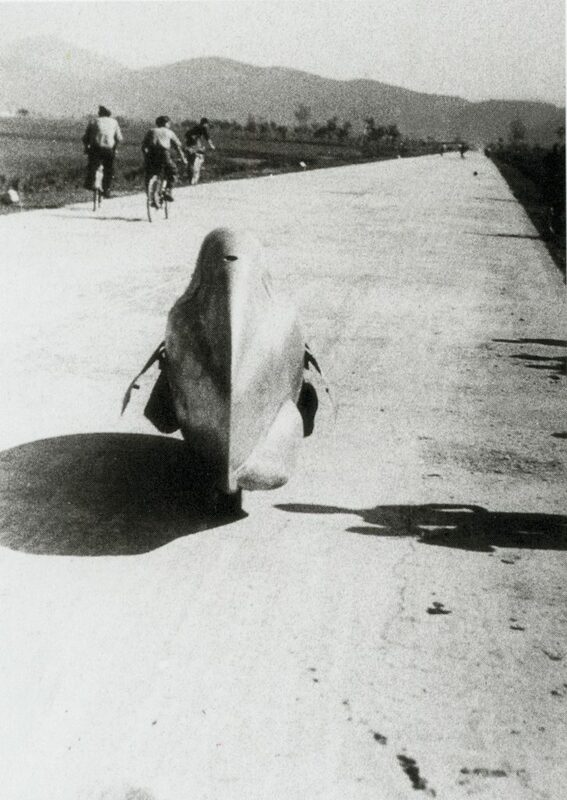 In 1958, a third Piaggio streamliner with full enclosure – a real wingless airplane – was tested on the Autostrada, but I can find no information about this attempt, just a few evocative photos. 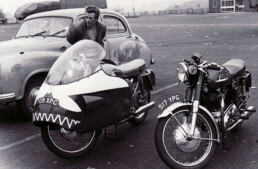 Factory battles for Land Speed Record supremacy faded out by the 1960s, after a Golden Age of 30 years’ effort on the international stage, that produced some of the most intriguing, no-holds-barred motorcycle designs of all time. 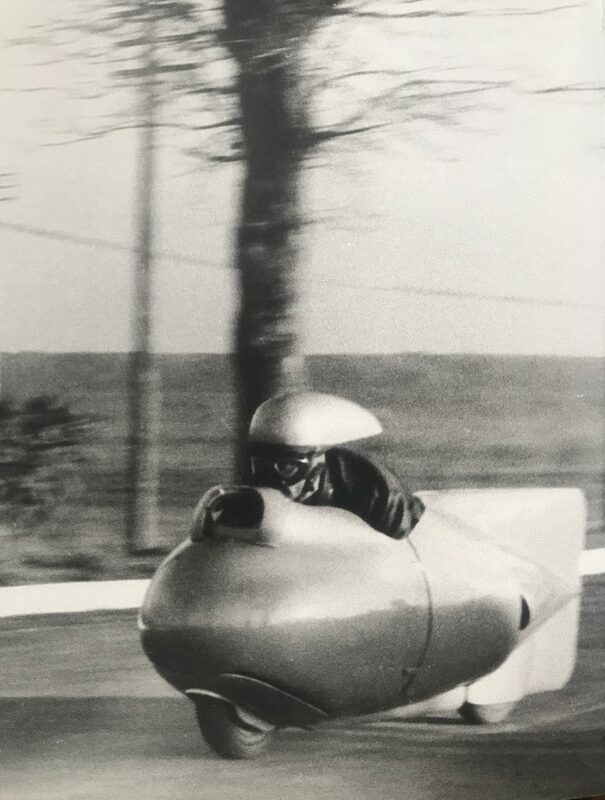 Looking very much like the 1930s DKW streamliners, on a smaller scale, this last Vespa bodywork is fully enclosed, with clever hatches for the rider’s legs. Not the cramped riding conditions, and the diminutive size of the machine! These photos were published in a terrific book, ‘The Flying Machines of Corradino D’Ascanio’, by Alberto Bassi and Marco Mulazzani (1999, Electa – Elemond Editori Associati, Milan Giorgetti), published for the exhibition of the same name in 1999 at the Spazio Giorgetti in Milan. 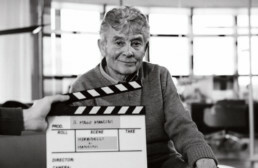 The photographs are from the State Archives of Pescara, the Archive Services for Abruzzo and Molise, Pescara, and the Walter Vitturi-Technifoto, Venice. 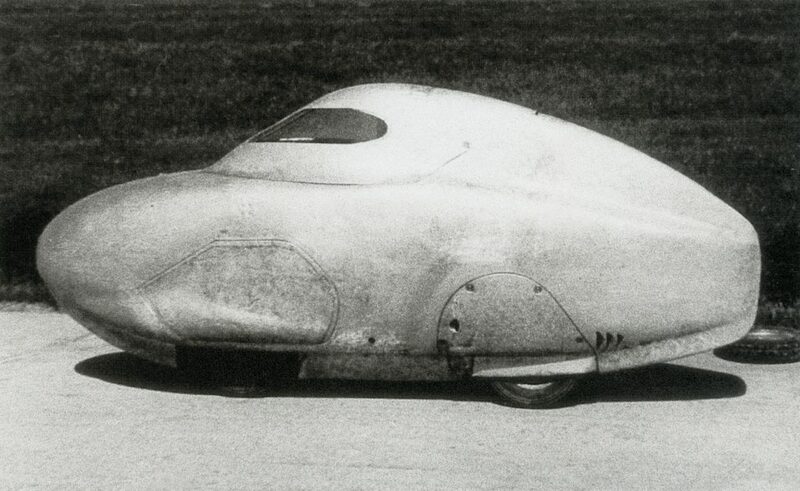 Corradino D’Ascanio’s original Piaggio racing design, built for record-breaking at Monthléry, and clearly influened by his aviation design experience over the previous 35 years. 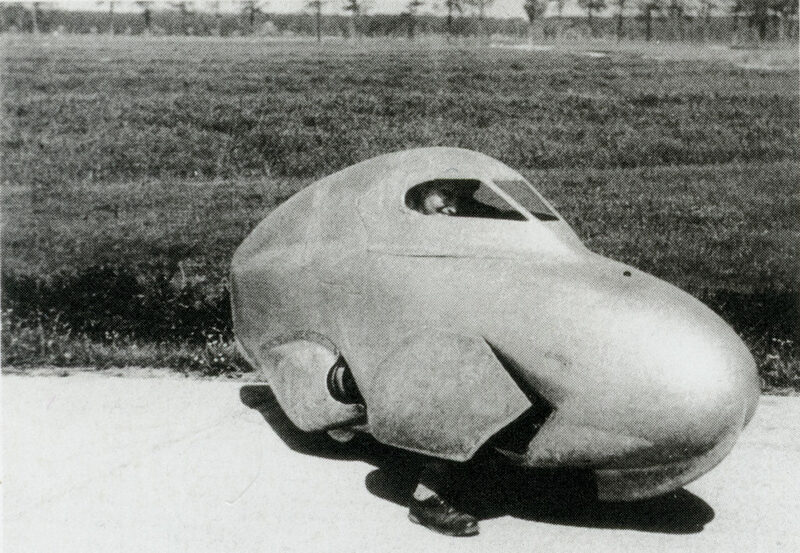 The machine is entirely hand-built, with its retro-futuristic shapes erotically organic, before the streamlined ‘torpedo’ shape – with is much smaller frontal area – was found to be much more suitable for top speed runs. again,fascinating! the engine of the 1951 racer sounds a lot like the engine drawn by von Dutch in the other article of this edition of “The Vintagent”! the engine of the 1951 racer sounds a lot like the engine drawn by von Dutch in the other article of this edition of “The Vintagent”! Funny how that works! 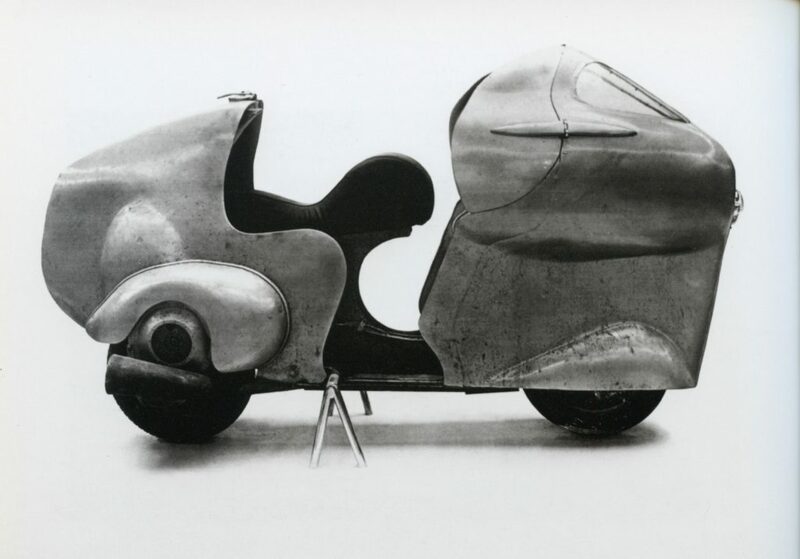 Yes, the second Vespa streamliner uses an opposed-piston two-stroke engine, while Von Dutch drew up a watercooled four-stroke engine. Even better, Piaggio actually built their motor, and it worked! a very interesting story, the opposed piston engine was also used in the Deltic Diesel train and the Chieftain tank (not very good in it’s final version’s) Commer designed, developed by Rolls Royce and butchered by Leyland (as the L60). Some lovely photographs there, thank you. 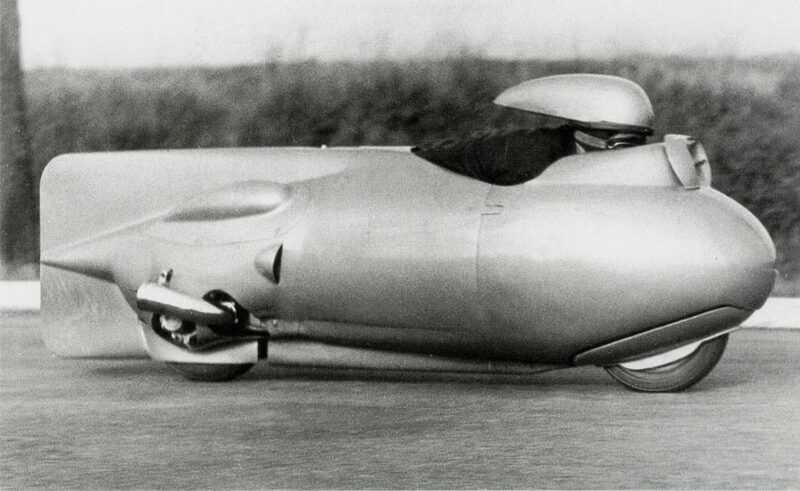 I would like to add that the 171kmh average (ie: two-way) top speed achieved by this record breaking 125cc Vespa in 1951 also broke the 175cc motorcycle top speed record at the time too. Also interesting is that while the engine was unique as a whole unit, it was based around a basic 3-speed Vespa engine of the time, with the extended barrel plus crank pretty much being added to the top end of a standard single cylinder engine, then wrapped for water-cooling. Of course it wasn’t as simple as that, but in layman’s terms it’s not far off. Certainly Vespa fans will visually recognise the bottom end of the engine.